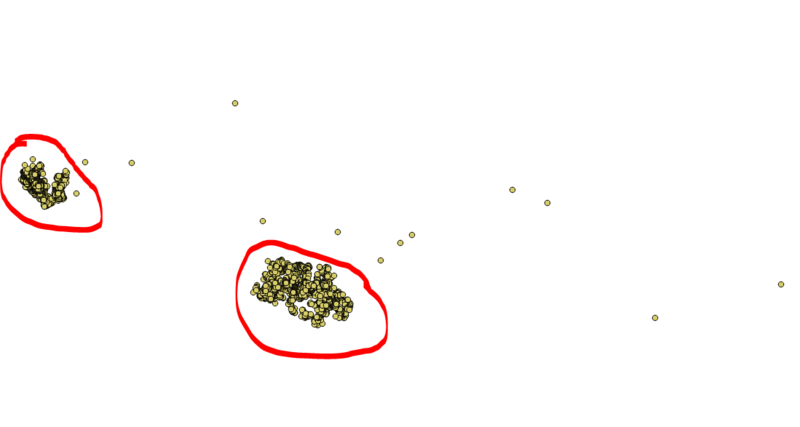 I have a cluster of points as seen below from a shapefile layer. I need an automated procedure (in PyQGIS or any) of filtering out those points that are outside or further-away from the center of the clustered points, by creating a new attribute field for the shapefile layer. The output would be the same shapefile but with an added field (named "Outlier"), where all the outliers points will be marked with a "1" and the rest with a "0". That is the points in red circle will have value of "0" while those outside the red mark will have the value of "1". Iterate over each polygon features and find the outliers and, if it contains only one (or a different value) point, then it is an outlier. If the current point is an outlier, assign 1, otherwise assign 0. Threshold is the threshold value to use for identifying the outliers (you should leave it set to 1, unless you need to manage particular situations). Not the answer you're looking for? Browse other questions tagged pyqgis clustering spatial-outliers or ask your own question.